Texas Leather Goods has been in business since 2004 with experience in the leather industry since 1992.
in the leather industry since 1992. Founded in Texas, Texas Leather Goods began as The Best Leather Vest in 1992 offering custom made leather chaps, vests, jackets, hats, purses, pillows and bed spreads to a wide range of retail stores. After 10 years of supplying Texas retailers with some of the finest custom clothing and home accessories, The Best Leather Vest became Texas Leather Goods and moved into the wholesale arena of home accessories and decor. Texas Leather Goods began as a sole proprietor by Jorge Rendon, with a total inventory of $1,200 in 2004. The operation took place out of an apartment with a one-car garage as its warehouse. Texas Leather Goods has slowly grown its inventory and customer base. In 2015 we were proud to move to a state of the art, 18,000 sqft facility that houses our offices and warehouse. Current inventory consists of hair-on cowhides, smooth upholstery leather, embossed leather and hair-on accessories. The initial idea behind Texas Leather Goods was to become the number one distributor of hair-on cowhides in the United States. Currently, TLG is the leading distributor in the Mid-West. Demand from customers and accessibility to other tanneries and distributors also pushed Texas Leather Goods to offer a more varied line of products. As TLG began to import all of its hair on-hides and started to buy in larger volumes, it added lines of smooth and embossed leather to not only sell to retailers but also expand its offerings to furniture manufacturers, designers, upholstery shops and various accessory and apparel manufacturers. Texas Leather Goods has now become a one stop shop to many different types of leather buyers. Number One Resource for Designers, Manufacturers and Retailers. Natural Cowhides are one of our specialties. 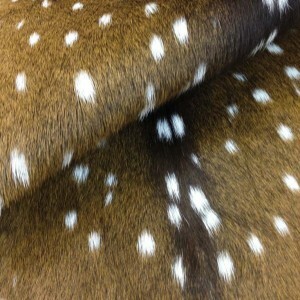 With over 100,000sqft of cowhides available at any one time, you can guarantee prime selection. We also offer a wide range of acid washed and stenciled cowhides. These are hides that have been processed with acid and burned to expose the dermis or hides that have been stenciled with designs, from animal print to abstract. Each hide is of premium quality and can be used as an area rug, in upholstery, accessory manufacturing, drapes and more! Embossed leather gives a creative & decorative look to leather by stamping a pattern onto the top-grain of the leather with steel engraved plates that have a decorative grain pattern. These faux patterns are indistinguishable from full grain pigmented leather. Our embossed patterns range from floral, geometric, exotic reptile patterns to western motifs. Smooth Leather is what we refer to as residential upholstery leather. We specialize in Full Aniline and Semi Aniline leathers. Most of our lines will be Wax/Oil Pull-ups, Vacuum Dry, and natural milled grains. We also carry a luxurious line of artisan leathers. At Texas Leather Goods you will also find a great assortment of other skins. These are available in natural colors as well as dyed depending on the product. We carry Hair-On Bison, Goat, Calf, Tibetan Lamb, Sheep skin (long wool), Shearling (short wool), Axis Deer skins and others from time to time.